So Meghan Markle has hired a doula and everyone is buzzing “what is a doula anyway?” Part 1. In this blog we will focus on Birth Doula support. A Birth Doula begins work with their client during pregnancy. Supporting them throughout pregnancy, labour and birth. We don’t clock out at 8pm. We are there by our clients side every step of the way. Offering continuity of care throughout pregnancy, labour, birth and postpartum. 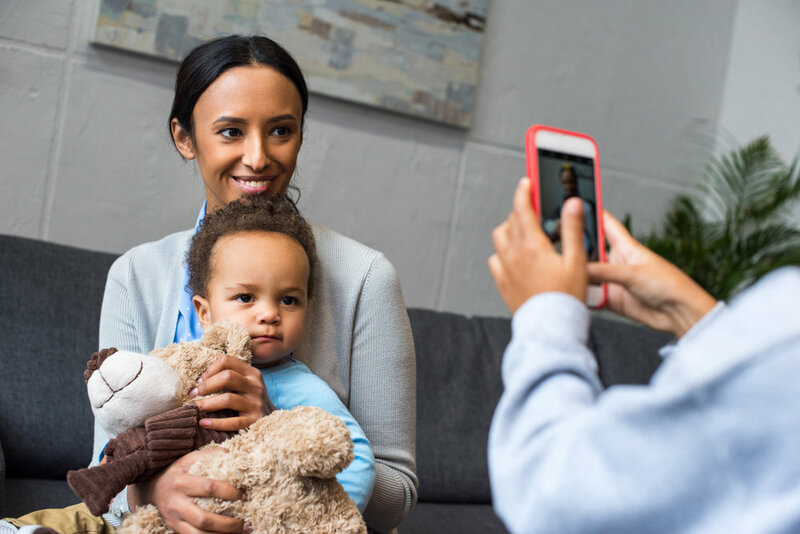 We then visit our clients at home, offering support with all those early parenting questions.. We offer knowledge, encouragement, information and hands on tips and tricks of the trade. Knowledge: We help our clients to understand their chosen place of birth (most commonly a hospital) policies.We compare the different hospitals policies, statistics and what the National Clinical Guidelines say. We also chat about International Guidelines and help our clients to make informed decisions about their care. We also cover the physical process of labour and birth and common things that come up. We can assist our clients to create their birth preferences for their unique journey. After baby arrives we share all the latest evidence on infant care, recovery after birth and anything else you’re wondering about too! Encouragement: We build up our clients. A huge part of our role is to help our clients (the birthing mother and her partner) to feel confident. We are like their coach or cheerleader from the sidelines, reminding them of all the skills they have gained throughout their pregnancy and the strength they have within. This does not stop once baby arrives. We build you up again after birth and remind you of that strength and knowledge. Information: Apart from the mentioned topics, doulas also answer any questions that happen to arise with each client. It may be they read an article online and wonder does that happen in Ireland? Or they are told they have a condition (such as gestational diabetes GD) and would like information to help them feel informed and confident on how best to manage it. Hands on tips and tricks: Doulas are not afraid to get in there and help out. During pregnancy we show our clients different massages, counter pressure and comfort measure to help during labour. We teach these skills to the birth partner so they feel fully involved in the process. On the day of labour often doulas and partners work really well together - tagging in and out (counter pressure can be really tiring after a few hours!) This support continues on into parenting. From showing you how to change and dress a newborn (which is surprisingly tricky at first) to helping you find a comfortable position to feed in - your doula will be right there. Partners: Partners are often Doulas biggest champions! We help them to feel involved every step of the way. Partners often say things like “I didn’t know what to do to help my wife” or “I felt like a spare tool in a scary unknown setting” but with a Doula supporting them - they have a full tool kit to draw from. They also get encouragement and a helping hand along the way. After they become a Dad/Mam we are still there. Helping them to adjust to their new role and offering guidance on how best to support you. With DoulaCare Ireland you have a full team of support. Each client is matched with two doulas. You have your primary doula and your back up doula. You have the opportunity to meet both. Both doulas will know your birth preferences and wishes. This means that if for any reason your doula needs to take a break (such as a long birth, where your doula may need to grab some sleep), you have the option of your back up doula joining you so you are never alone! Our co-owners Jen and Mary are always on hand too. We offer phone and email support to our clients and our doulas so no question is ever left unanswered. In next weeks blog we will discuss Postpartum Doula support. So many of our DoulaCare Ireland clients do not believe that VBAC’s actually happen in Ireland. Well as a doula I have supported them, as an antenatal educator I have taught parents about them and earlier this year I experienced a VBAC personally. As Kayla’s birthday starts to draw closer, I have started to write my birth story. I will upload it in two parts (its a long story even though the birth itself was fast) That will give you all a full run through of my VBAC. There was lots of talk about elective caesarean but I held firm that I would like to try for a VBAC. I was confident in my body’s ability to birth my baby. There was a lot of negotiation and I found being informed about my options really helped in these situations. I knew the benefits and risks and studies that were done around vaginal birth after caesarean and also repeat caesareans. I was never against caesarean. I knew it was one option and if that ended up being the case I was ok with it, once I was listened to. My main priority was always to have a safe birth BUT I also wanted to have a positive experience. I found having doula support a great advantage as I had someone that I could bounce my thoughts and feelings off, who was non-judgemental and impartial and made a great sounding board for me. They supported me as I mourned the birth I wanted (to labour at home before going into hospital), and help prepare me for my change in circumstances. The brain training techniques in the GentleBirth app also helped me keep my focus and stay calm as things changed for me. During my pregnancy I did all I could to empower myself. I worked on my physical and mental health. Over the 9 months I worked on building a positive mindset. preparing my husband to be my advocate. I armed myself with great support, in the shape of my informed husband and my wonderful Doula. I took time for self care. I had regular reflexology, used aromatherapy, had shiatsu, realigned my pelvis with chiropractic treatments, listened to daily affirmations, GentleBirth tracks and had a vision board. I knew my VBAC wasn’t going to just land in my lap. I had to take ownership and prepare for it. I stayed really positive and used my time on the antenatal ward to focus my mind and prepare my body. 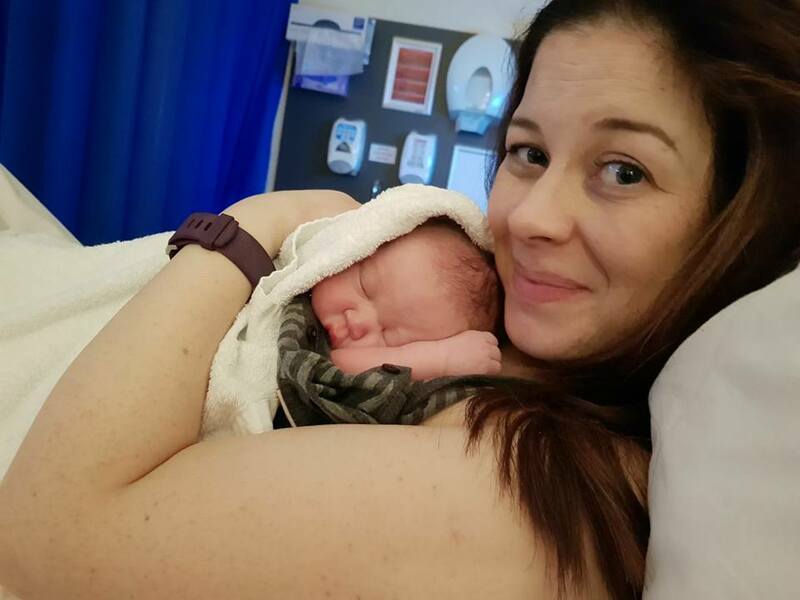 I went into spontaneous labour just as I was going to bed on the 24th of March. I did consent to having the CTG, even though I had originally felt I did not want it (more detail to come in my birth story) However I was clear that I chose my own position and moved with my body. Kayla Rose entered the world at 4.17am, the night the clocks went forward. So my labour lasted less than 3 hours. She was 8lbs 2oz, at 38+6 gestation. I escaped with only a small 1st degree tear and no abnormal blood loss. Jen with baby kayla enjoying skin to skin,surrounded by love with (hubby paul taking the photo), midwife jo (rotunda) and doula mim. It was such a high and I was so proud of myself. I haven’t really spoken about that high much. There was complications after, as Kayla was born with an undiagnosed cleft palate and Pierre Robin Sequence but that was not connected to our VBAC. My moment of euphoria only lasted a second before we realised something was wrong with our baby. So after a bit of my story…. I experienced a VBAC in an Irish maternity hospital. Yes at times during my pregnancy I felt like there was a huge spotlight over my head. Yes I had to negotiate and be firm at times. Yes I had a wobble myself during labour, when I had a burning sensation across my scar but I did it. The evidence says many more woman can safely do it too. Preparing for a VBAC can definitely be a rollercoaster and support is crucial. Most people (including health care providers) just assumed I would be having a repeat Caesarean. I knew VBAC was safe, I was aware of the evidence and for me it was the option I hoped for. There is a lot of misinformation out there about VBAC birth. You will hear care providers tell people that they can have a VBAC but only labour for so many hours as it is dangerous for the scar (not evidence based), or they cannot go over 40 weeks in case the scar ruptures (not evidence based), or because it has only been 2 years since their last baby their scar may be too weak (not evidence based)…you get the picture!!! So in order to have a successful VBAC you do need to prepare yourself. Below I have listed some of my top tips for anyone hoping for a VBAC. What are my top tips? Empower yourself with knowledge and the latest evidence. Educate yourself and your partner so they are also aware and can advocate for you if needed. Take an independent childbirth class - a Cuidiu antenatal class or a GentleBirth workshop, or a VBAC specific workshop (also given by an independent provider). Try to be under midwifery led care if possible. 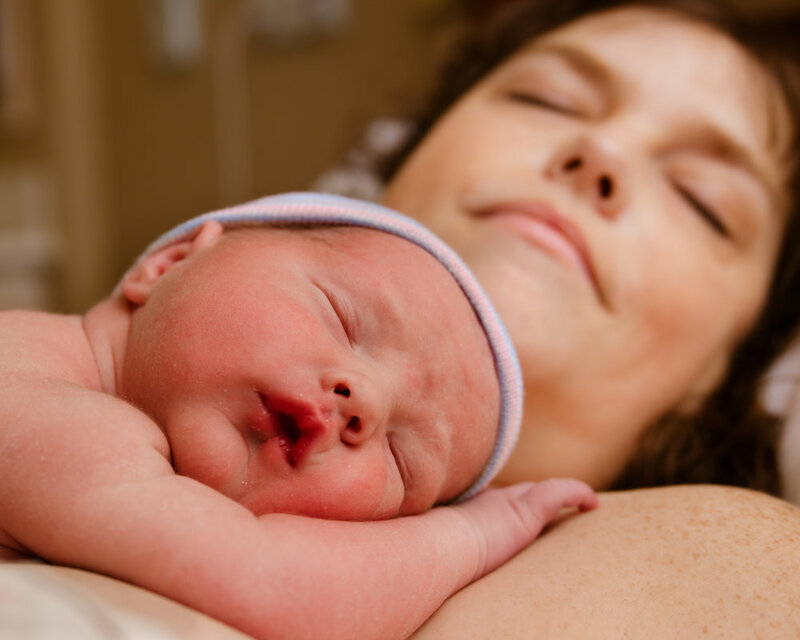 What are the BENEFITS of a repeat caesarean? What are the RISKS of a repeat caesarean? What does my gut INSTINCT say? Need more INFORMATION? Remember DoulaCare Ireland are here to support you through your VBAC. Ask us questions, gain information & support but above all, gain the skills to make informed decisions for your individual situation. I wish you luck on your journey. Whatever the outcome, what is important is that you have a positive experience - at the centre of that is making informed decisions and feeling supported. Things are not always as they seem on Social Media! Social media like Facebook portrays an image of happiness and beauty. Everyone full of smiles, surrounded by friends and family, women with perfect make up, children looking sweet, even their house looks clean and decorated so beautifully in the background! Social media is a great way to stay connected to people, get peer support and find out about local resources. Remember to take off the rose tinted glasses and see behind the staged scenes of family photos. Reality is that there was probably shouting or bribery (or both) to get everyone in and smiling. If we capture that moment we can feel proud posting it, banking that moment in time for the future. So your life isn’t perfect, your kids are a pain in the backside most of the time, your house is a mess and your partner is a nightmare. Whose isn’t? Feel comfort in knowing we are all in the same boat ☺ Reach out to friends to chat. Go to peer support groups. Have a moan, then have a cup of tea and a biscuit, take a deep breath and enjoy the rest of your day. Because even if your life isn’t perfect, you will never have this moment again. Your little ones will never be at this stage again. Sometimes the days can feel endless but the weeks disappear so quickly so savour every precious moment and breath through the hard ones.